We, as a nation, have always vied for the top spot , be it cricket , economy or education or rather everything else. However surprisingly we have hit the top spot only on air pollution. 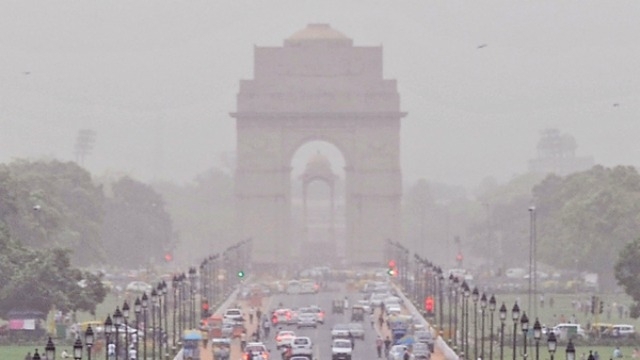 Reports indicate that the national capital, Delhi has the worst air quality level among 1600 cities across the world. I suddenly realized why the craze to buy an air purifier all of a sudden, kinda hit the roof in the city, though it became super expensive at a stage. As against a standard limit of 60 for PM2.5 and 100 for PM 10, Delhi hit 999 micrograms per cubic meter in Nov 2016, making it one of the worst smogs the city has ever faced (Smog = Smoke + fog). That is more than 15 times the limit, which can lead not only to asthma, sinus, lung/respiratory diseases but also cause terminal diseases like cancer. (PM 2.5 stands for particles less than 2.5 Microns while PM 10 stands for particles lesser than 10 microns). It's only fair to expect that basic Oxygen we breathe day in and day out should be pure, devoid of any pollution . But that’s a short lived dream. Given the rising population , growing no of vehicles of the road , while we build more and more concrete jungles , the air quality has taken a drastic hit in the roads. So now we safely assume that it’s better to stay indoors, as there is no pollution inside and air is pretty clean. We couldn’t have been any wrong than that. It is not only the lack of awareness of indoor air pollution that hits us, but also the dangerous side effects we have been ignoring all along. Quite shockingly, we are constantly vulnerable even more diseases, which outside air pollution usually causes. Next time you feel dizzy or have a splitting headache , it could also be because of strong air pollution levels. The wood we have in our living room has a special element called formaldehyde which can be a harmful agent. This formaldehyde is something that’s used in construction materials, be it a plywood material or an adhesive. These are further used in wooden furnitures and is a strong element to further deterioriate your indoor air pollution levels. Long exposure to foul odors within a closed environment can lead to absorption of harmful elements/chemicals which gets further mixed with the indoor air that’s being circulated. Be it ammonia, garlic smell or even sweat, the threat is very much real though invisible. Dust : When we fail to clean our houses on a daily basis, the dust getting accumulated thanks to a blower fan or the windows being kept open, the air is very much susceptible to getting polluted quickly. If quality of outside air is at an all time low, keep the windows closed at all times. Smog hits generally early in the mornings, and that's the time you need to prevent that from seeping inside. Dust every part of the house on a regular basis. No exceptions for Sweeping/Cleaning daily. Spray room freshners if any foul smells linger for a longer period of time. Remove any unnecessary object/clutter in the living room or bed room. These can be the main places where dust accumulates. Shoes and slippers should strictly be kept outside to prevent outside germs from mixing into the floor . It doesn't take few seconds for a wind to pick them and mix them along with the air. Cigarette smoking should strictly be prohibited inside the house, even if you are the single person living inside. Plants kept inside the house generally absorb harmful gases like CO2 and other pollutant agents, while emitting fresh pure oxygen. Though we have air purifiers and other electronic devices to monitor the air quality and filter them as required, it’s not possible for them to run 24x7, thanks to rise in electricity costs and also the machine wear and tear. I came across this new innovation by Asian Paints called “Royale Atmos”, a paint that actually has the capability to absorb odours/foul smells and even harmful agents such as ammonia or hydrogen sulphide. So what does Royale Atmos actually do? Coming from the stable of the most premier paint company in the world, Asian Paints, Royale Atmo not only eliminates indoor air pollution, adds to the fragrance of the house but also has a smooth matt finish and a Teflon surface protector to protect itself from stains. We now have walls with special paints that not only safeguards from security but also protects from indoor air pollution. I feel,we have now arrived! Just head to the Asian Paints Royale Atmos site and you might find yourself a lot of information to help you battle indoor air pollution. Check out this ad featuring Deepika Padukone telling you why this might be the next big thing in reducing indoor air pollution.